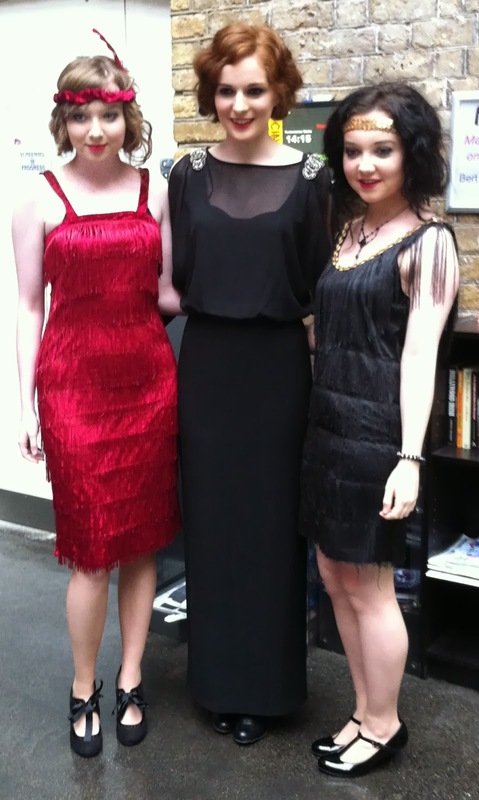 ‘The Great Gatsby’: A Truly Great Day! On December 3rd last, forty-six fifth year students made a most enjoyable and educational trip to the Irish Film Institute in Dublin. 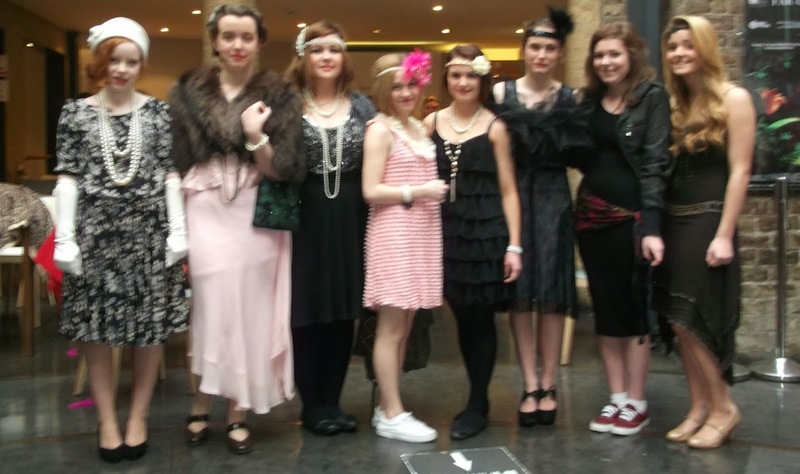 All are studying F.Scott Fitzgerald’s ‘The Great Gatsby’ as their single text for Leaving Certificate English 2015. This will be the first time since 2001, the inaugural year of the current examination format that higher level students have elected not to study a Shakespearean work as their single text. It is thus a landmark of sorts for Loreto, Navan. Never fear though, Shakespeare has not been abandoned completely! Either ‘Othello’ or ‘King Lear’ is being taught as part of the comparative studies instead. Before the screening, one of the IFI’s Education Officers addressed the group; congratulating it for the accuracy of its sartorial efforts and delivering a short lecture on both the social context of the film and the stylistic features of its director, the aforementioned Baz Luhrmann. The directorial presence of Luhrmann (whose previous works include’ William Shakespeare’s ‘Romeo and Juliet’ and ‘Moulin Rouge’) is unmistakable in almost every scene of the film. Indeed some may regard this omnipresence of the director as somewhat intrusive: the film is, at times, more Luhrmann’s ‘Gatsby’ than Fitzgerald’s! It is simultaneously a gorgeous and opulent feast for the eyes and paradoxically, a gaudy riot of vulgar and exaggerated technicolour. There are certain shots which are almost cartoon-like in appearance. There are those, of course, who would claim that this is exactly as Fitzgerald intended! The deliberate anachronism of the contemporary soundtrack is similarly admired by some, criticised by others. Yet it certainly serves as an effective aural link between the hedonism of the ‘Roaring Twenties’ and the very recent excesses of the pre-recession Western World. There are solid but unexceptional performers by all the major players. (Leonardo Di Caprio, Carey Mulligan, Toby Maguire.) Luhrmann’s critics claim that Luhrmann himself is always the star of his own shows! Some changes have been made to both the plot and to the characters –Nick’s narrative is delivered to his psychiatrist who encourages him to write as part of his therapy! Gatsby’s father does not appear at his funeral and Wilson is so filthy and stupid as to be almost entirely unworthy of our sympathy! Myrtle is more bawdy than voluptuously seductive. All told, the film lacks the political bite of the novel! The Daisy-Gatsby love story is primary and any political allegory is secondary if not entirely absent! F.Scott Fitzgerald’s novel is a marvellous and witty satire of 1920’s America – a bitter indictment of the concept of the ‘American Dream’. Luhrmann may purposefully have chosen to play down this element of the novel – commercial necessity usually trumps artistic endeavour in Hollywood! Did any of this affect the pleasure of the outing? Not a jot! 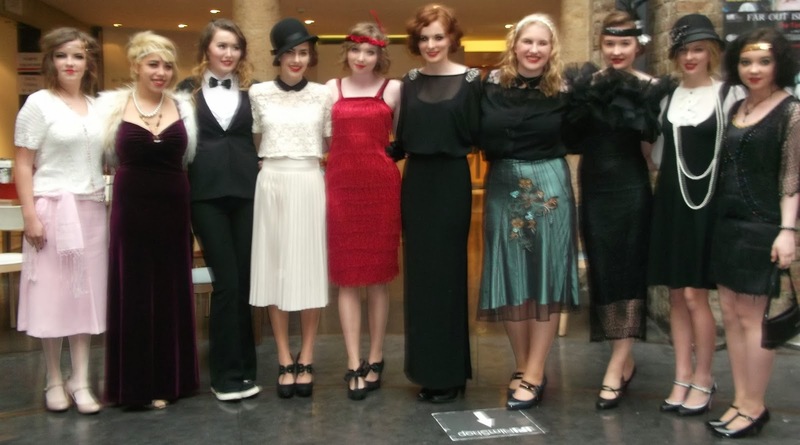 We revelled in the attention on Dame Street: bystanders literally gaping as they witnessed dozens of ‘flappers’ and ‘aristos’ making their way to the screening on a cold and drizzly winter morning! The soup and sandwiches which were served to us in the IFI’s ‘members only section’ were beautifully presented but alas not entirely relished! Apparently the sandwich-fillings were authentically 1920’s- style fillings. We didn’t enjoy them! Mrs. Ryan-Widdis made a noble attempt to disguise our ignorance as feminine daintiness (typical of the genteel Loreto girl). However, no such ethereal feminity was in evidence as we dived into the more contemporary and no doubt plebeian offerings of the nearby ‘Spar’! A girl must eat...even on a bus! Many thanks to Mrs Ryan-Widdis who organised the trip and to both Ms Delaney and Mrs Ryan- Widdis who accompanied us on the day. 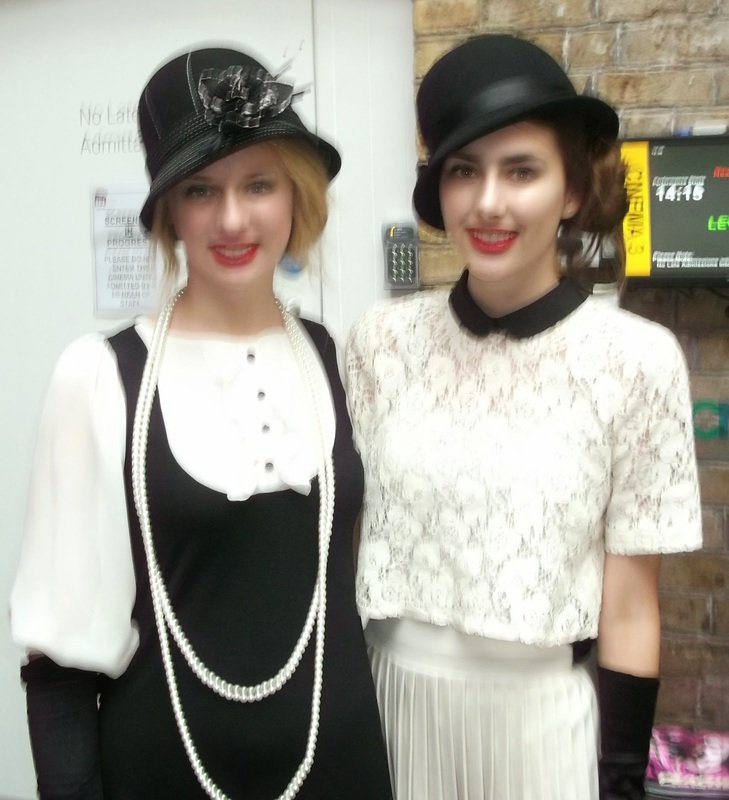 Both were in 1920’s attire. Ms Delaney was so unrecognisable in her blonde bob that she was not identifiable even to her own students! (Amusing anecdote deliberately omitted here!) Somehow there is no pictorial evidence of our teachers. It would seem that they are rather more reserved than the rest of us! Thanks also to Ms Marsh and Mrs Ryan who made the trip possible and who were there to admire us before our early morning departure! Finally a word of congratulations to both Lisa Murray and Tara Walsh who won prizes for most independently-sourced and original costumes on the day. 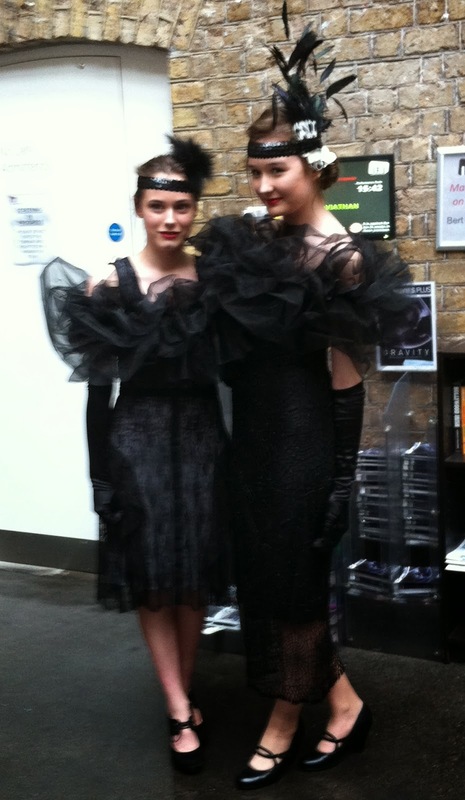 ‘The Great Gatsby’: a truly great day!